Following on from their recent release of The Hunters (Jägarna), Arrow Films have now announced the January Blu-ray and DVD release of its sequel, False Trail (Jägarna 2). 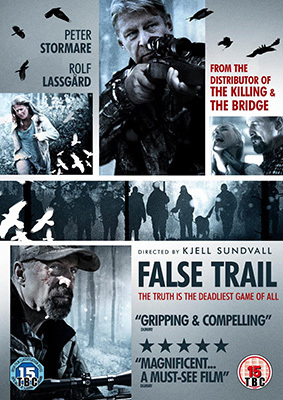 From Director Kjell Sundvall and the producer of The Hypnotist Peter Possne, with the star of Wallander, Rolf Lassgård, False Trail is the latest Nordic Noir thriller to hit the big screen in the UK. Set in an isolated town in the frozen wastelands of northern Sweden, False Trail is a dark, twisted murder investigation that devastates a local community. The film also stars Peter Stormare (Fargo, The Big Lebowski) as Torsten, Annika Nordin as Karin and Kim Tjernstrom as Peter. It’s been fifteen years since Erik (Lassgård) was forced to leave the Norrland Police Department. Since then he has become the National Murder Commission’s best interrogator. When Erik’s boss orders him back to his home town to solve a brutal murder, he hesitantly returns as the thought of going back stirs up unpleasant memories. What at first appears to be a simple murder soon proves to be something much more complicated, as Erik finds himself with a new nemesis, Torsten (Stormare), to contend with and events take a very sinister turn. False Trail (Jägarna 2) will be released on UK Blu-ray and DVD on 28th January 2013 by Arrow Films at the RRP of £19.99 for the Blu-ray and £12.99 for the DVD. No extra features have been revealed as yet.